Legendary Treksperts Mark A. Altman (Free Enterprise, The Fifty-Year Mission) and Daren Dochterman (ST: TMP - Director's Edition) examine five decades of #STARTREK every week along with special guests from across the Star Trek universe. "LIVE @WONDERCON: STAR TREK V 30th ANNIVERSARY - WE NEED OUR PAIN"
"WISE GUYS: RE-MAKING THE MOTION PICTURE"
"REMEMBERING LEONARD: HE'S NOT REALLY DEAD AS LONG AS WE REMEMBER HIM"
A very special celebration of WILLIAM SHATNER’S 88th Birthday as the Treksperts are joined by special guests ASHLEY E. MILLER (Thor) and ROBERT MEYER BURNETT (Free Enterprise) to celebrate the amazing career of an American (and Canadian) national treasure. 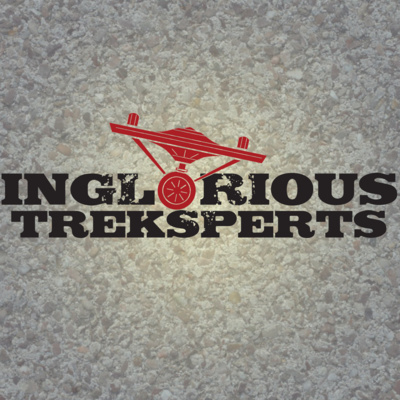 Find out what god needs with a podcast, this week on Inglorious Treksperts . The Treksperts are joined by BILL HUNT, editor of The Digital Bits, and commentator Robert Meyer Burnett as they discuss the history of #StarTrek on home video from VHS to streaming and everything in between. "WOLFE IN THE FOLD: REMEMBERING DS9"
"CAPTIVE PURSUITS: THE TREKSPERTS GET TRIVIAL"
The Treksperts are joined by Trek comic book writers DAVID & SCOTT TIPTON (“The Q Conflict”) along with guest commentator ROBERT MEYER BURNETT as they have a freewheeling conversation about the history of #StarTrek comics and graphic novels. "LOVE IS THE (VENUS) DRUG: TREK'S GREATEST LOVE STORIES"
"PERMISSION GRANTED: BOARDING CHEKOV"S ENTERPRISE"
"IT'S BEEN A LONG ROAD: REVISITING ENTERPRISE"
The Treksperts look at the incredible four year saga of STAR TREK: ENTERPRISE with series writer/producer MICHAEL SUSSMAN and director ROBERT BURNETT (Free Enterprise) on the only weekly podcast for #StarTrek fans with a life. "NEW HUMANS, LOVE COACHES & V'GER, OH MY - THE NOVELIZATION OF STAR TREK: THE MOTION PICTURE"
"CAPTAINS COURAGEOUS: TREK'S BEST CAPTAINS"
"NOTED & LOGGED: THE MUSIC OF STAR TREK"
"STAR TREK'S TOP 50 EPISODES OF ALL-TIME, Part Three"
Eps. 10 - 1. 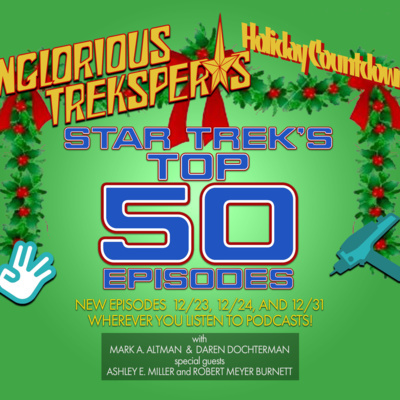 The holiday countdown concludes with the final ten episodes of the STAR TREK TOP 50 EPISODES OF ALL-TIME as the INGLORIOUS TREKSPERTS reveal our final ten greatest episodes ever! 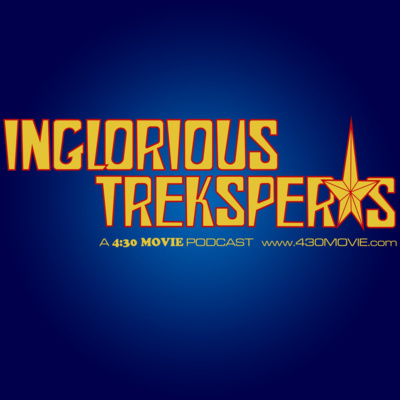 All-new episodes of INGLORIOUS TREKSPERTS continue next Sunday and are available every week wherever you listen to podcasts including our ongoing celebration of the 40th anniversary of STAR TREK: THE MOTION PICTURE all year long. #STMP40. How do you vote Sarek of Vulcan? You can let us know YOUR favorite #StarTrek episodes at: Twitter: @inglorioustrek Instagram: @inglorioustreksperts Facebook: facebook.com/inglorioustrek And if you're a #StarTrekDiscovery fan, don't miss our sister podcast, DISCO NIGHTS, hosted by Deep Space Nine's CHASE MASTERSON wherever you listen to podcasts. 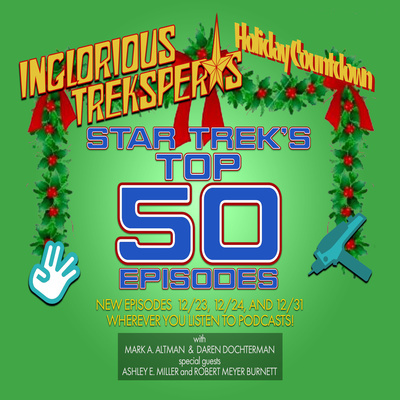 "HOLIDAY FREQUENCIES OPEN: A THANK YOU FROM THE INGLORIOUS TREKSPERTS"
"STAR TREK TOP 50 EPISODES OF ALL-TIME, Part Two"
EPS. 51-26. The ultimate countdown begins as the Treksperts countdown the greatest 50 #StarTrek of all-time. New episodes available on Christmas and New Year’s Eve. AREX YOU HAPPY TO SEE ME? "BONUS EPISODE: WHAT'S FUTURE IS PROLOGUE: WHAT'S NEXT FOR TREK?" "WHAT'S THE DEAL WITH DR. SPOCK?" "BIG BADS: TREK'S GREATEST VILLAINS"
BONUS EPISODE: "DISCO NIGHTS: CONTEXT IS FOR ASHLEY"
Check out a VERY SPECIAL BONUS EPISODE of our sister podcast, DISCO NIGHTS WITH CHASE MASTERSON, in which guests ASHLEY E. MILLER (The 4:30 Movie, Thor, X: Men-First Class), ALIZA PEARL (Nerdist, Geek & Sundry) and ANTHONY PASCALE (Trek Movie) join host CHASE MASTERSON as she leads a spirited discussion about the new season of #StarTrek Discovery. 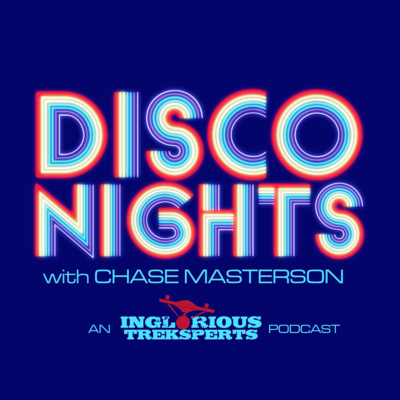 New episodes of DISCO NIGHTS are available every Thursday. Twitter: @disconightspod. Instagram: @inglorioustreksperts. "WHAT'S UP, RUK? COMEDY IN STAR TREK"
Co-hosts MARK A. ALTMAN (The Fifty-Year Mission, Free Enterprise) and DAREN DOCHTERMAN (ST:TMP Director's Edition) are still wild about Harry when they're joined by writer/producer/showrunner JESSE ALEXANDER (Star Trek Discovery, Heroes, Lost) as they discuss the strange journey of Harry Mudd throughout #StarTrek history and preview the new podcast, DISCO NIGHTS, hosted by Deep Space Nine's Chase Masterson. Twitter: @inglorioustrek. Co-hosts MARK A. ALTMAN (The Fifty-Year Mission) and DAREN DOCHTERMAN assimilate guests #Voyager writer LISA KLINK and director ROBERT MEYER BURNETT as they discuss one of the greatest antagonists in #StarTrek history. Resistance is Futile! Twitter: @inglorioustrek. Co-hosts MARK A. ALTMAN (The Fifty-Year Mission. The Librarians) and DAREN DOCHTERMAN (ST:TMP - Director's Edition) are joined by writer/producer ASHLEY E. MILLER (Fringe, Lore, X-Men: First Class) and director ROBERT MEYER BURNETT as they look back at the beginning of #StarTrek toys and merchandise. Twitter:@inglorioustrek. Instagram: @inglorioustreksperts. New episodes every Monday at 17:01. Legendary Treksperts Mark A. Altman (Free Enterprise, The Fifty-Year Mission) and Daren Dochterman (ST: TMP - Director's Edition) examine five decades of #STARTREK every week along with special guests from across the Star Trek universe. New episodes debut every Monday. Let's see what's out there. Co-hosts Mark A. Altman (Free Enterprise, The Fifty-Year Mission) and Daren Dochterman (VFX Supervisor, Star Trek: The Motion Picture - Director's Edition) unveil the ultimate STAR TREK podcast as they do a deep dive into the lead-up to the launch of STAR TREK: THE NEXT GENERATION in 1987 and discuss what to expect in coming weeks as the INGLORIOUS TREKSPERTS boldly go where no podcast has gone before.